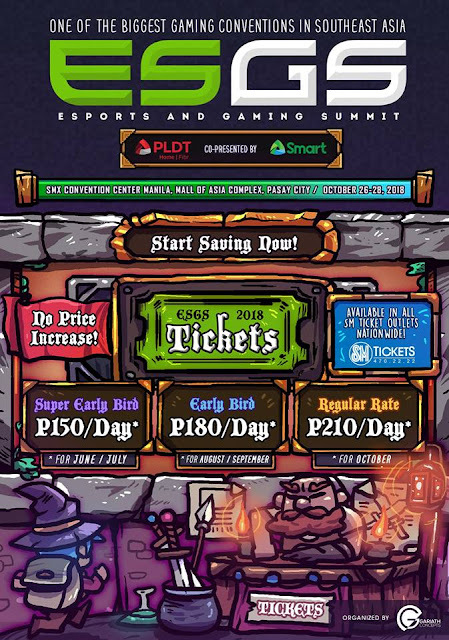 [18 June 2018] Gearing up to bring another epic experience for Filipino gamers and fans, eSports events organizer Gariath Concepts has teamed up with leading digital services providers PLDT Inc. and Smart Communications (Smart) for the upcoming Esports and Gaming Summit 2018, the Philippines’ biggest gaming convention slated on October 26 to 28, 2018 at the SMX Convention Center, Pasay City. PLDT Home Fibr and Smart are Co-Presenters of ESGS 2018 PLDT Home Fibr and Smart will make a return as Co-Presenters of ESGS, in line with their push to provide the ultimate gaming experience for all Filipino eSports fans and enthusiasts - whether through lag-free broadband connection at home, or via fast LTE connection on the go. Since 2013, both PLDT Home Fibr and Smart have been supporting the event, always dishing out exciting experiences and exclusive treats for customers. ESGS 2018 tickets will be available starting on June 1 at all SM Ticket outlets nationwide. Tickets are also available for online purchase at https://smtickets.com/events/view/6772. Stay tuned for more exciting announcements for the much anticipated ESGS 2018! Visit www.esgs.ph and follow www.facebook.com/ESGSPhilippines for more information.